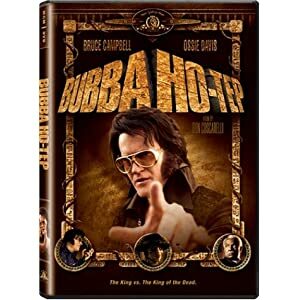 Bubba Ho-Tep is the story of a geriatric Elvis Presley, confined to a Texas nursing home that he shares with JFK, who was dyed black and hidden away after the failed 1963 assassination attempt in Dallas. Bummer for them that an ancient Egyptian mummy is roaming the halls of the convalescent home, sucking the souls of the elderly out of their buttholes. Go ahead and read that again. Because despite the previous paragraph, this move is legitimately very, very good. We all know movies rely on a willing suspension of disbelief. But Bubba Ho-Tep almost invites you to *not* suspend disbelief, and just see how far you can make it. Bruce Campbell has never been better, and Ossie Davis was a titan of acting, so by the time these two characters pause to talk about the pain of being absent fathers before heading out with their wheelchair and walker to battle a 5,000-year-old soul-sucking mummy...well, dang it, you're going to believe them and you won't be able to help it. Cult Value Coefficient: 9/10. Yep. Because JFK didn't die. He was dyed black. And hidden in Texas. This whole time. And fought a mummy. With Elvis.